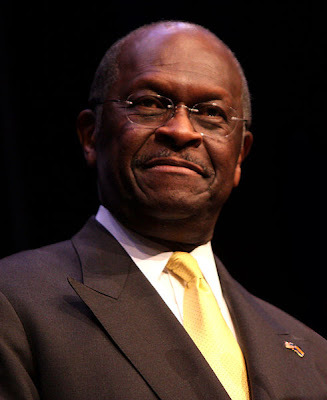 The fact that Herman Cain is now close to the lead, and his risible 9-9-9 plan is getting a lot of attention is really amazing, and speaks to the depth of the contempt that conservatives have for Mitt Romney, but on another level it has finally breathed life into the graveyard that is conservative economic policy. Just think of the history. For the past 30 years conservatives have had tax cuts as their be-all and end-all remedy for every economic problem. Stuck in a recession? Cut taxes. Budget deficits? Well, tax cuts really raise revenue, so just cut them some more. Got a bit of a surplus? You guessed it, tax cuts. Alan Greenspan was even arguing back in 2000 that the primary policy problem we faced was the national debt being paid off too quickly. But while Reagan's and Bush's tax cuts did give most of the benefits to the rich, they at least threw some scraps down the income ladder. Nowadays, though, we've got new ideas. We're going to drastically cut taxes on the rich...and raise them on the middle class and the poor! Presidential candidates are actually arguing this on national television. Conservatives have convinced themselves it's a winning grassroots strategy. Hey, give them credit for trying. It's a bold, fresh, innovative idea that only suffers from the slight defect of being stone batshit nuts.